Colleen Cutschall is a senior artist originally from Pine Ridge, South Dakota. For over twenty years, she has been working and living in Southwest Manitoba as an artist, art historian, educator and curator. Cutschall holds a BFA from Barat College, Lake Forest, Illinois, and a MS.ED from the Black Hills State College, Spearfish, South Dakota. 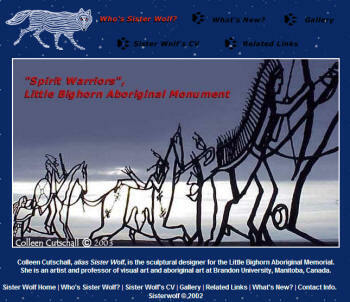 She has had numerous solo exhibitions that include: Voices in the Blood, a touring exhibition organized by the Art Gallery of Southwestern Manitoba, House Made of Stars, The Winnipeg Art Gallery, and …Dies Again, Urban Shaman Gallery. Cutschall has produced numerous publications and lectures on Native issues and art nationally and internationally. She recently partook in an artist – in-residence in Bellagio, Italy. Cutschall is a Professor and Chair of the Visual and Aboriginal Art Department at Brandon University, and continues to work on her artistic practice. This is an excerpt from an interview, where she shares her thoughts on art and art issues in Manitoba. Cathy: You are originally from Pine Ridge, South Dakota. After coming to Manitoba to partake in various spiritual ceremonies, you decided to stay and pursue an arts career. What was the artistic and cultural climate like when you first moved here? Colleen: I felt like I arrived at a moment when there had been something extremely relevant happening with modernist art in Canada. But I arrived into an inactive space…One that certainly had strong memories of what had just past, but there wasn’t the leadership in Manitoba to continue. It had died or it had moved…Jackson Beardy had recently died, Daphne Odjig had moved. Cathy: So you’re talking about the impact of the Woodland School Artists? Cathy: What challenges did you face as an emerging artist starting out in Manitoba? Colleen: I couldn’t find a public venue of any kind that was exhibiting Aboriginal art at all. The only think I could immediate locate was the Inuit art collection at the Winnipeg Art Gallery. At that time, I was ready to be an explorer, but I think Aboriginal art for whatever it was in Canada and this region, was inactive. I was very frustrated by that obviously. I knew as a young person that I wanted to be an artist. Simultaneously, there were some extreme barriers…whether as an Aboriginal person I would even get close to the opportunity for an education, much less a career or receptive public. Did I have a way to relate to them, or would I have to transform myself into somebody else to be an acceptable artist to them? So my whole experience in terms of how to gain a career or reputation as an Aboriginal artist, it came about from two major political movements in the early part of my career. That was the whole American Indian Movement throughout North America, combined with the Women’s Movement simultaneously. Those two things very much affected where I am today. Cathy: You are a very eclectic artist. You constantly push yourself artistically and your mediums. As a curator I find it exciting to work with you, because I never know what you’re going to produce for an exhibition. What do you consider your artistic mediums, areas of interest, or expertise? Cathy: Aboriginal artists are constantly navigating around cultural expectations and definitions. How do you define yourself? Colleen: When you first asked me to do this interview we came back to this whole question about whether you are an artist who happens to be Aboriginal or are you an Aboriginal artist. For me, that question is 35, pushing 40 years old at this stage. That’s not a question that I find very many Aboriginal artists asking me, or concerning themselves about too much. To me it’s a question of privilege that this question has existed for so long. Cathy: What do you mean by that? Colleen: It’s a privilege that you can even ask that. That you’re in a position to make those distinctions. The biggest question to me is what is Indian art. You only ask that question to Aboriginal artists. They didn’t direct that question to non-Aboriginal artists. When you directed the question to the artist their answer depended on their nationality… I wonder if other nationalities get that same question asked after all those centuries. Whether you’re a practicing artist or a curator, we’re expected to answer for so many nations, and non-Aboriginal people don’t consider just how many nations that we somehow have to respond to, to answer to their histories, their cultures , to represent when we are not of their nation. So there is an extreme amount of pressure there that I don’t think was ever fully understood. Cathy: Over twenty years, you have been part of, or exposed to the changing climate for Aboriginal artists in Manitoba. What are some of your observations? Colleen: The energy for wanting to develop Aboriginal arts came from the grassroots level. It came from people who were not professionals, but who were striving to be. And of course that was accompanied with an enormous load of a lack of management, lack of infrastructure, lack of understanding how the professional arts community worked. All of those are enormous barriers, but there was a growing, steady energy and it didn’t all succeed. Eventually, I did start to see some pretty major things happen. The real catalyst was the establishment of Urban Shaman as an artist run centre. What it brought with it was another level of professionalism that hadn’t existed. They took the responsibility of saying we all need some professionalism and brought themselves and others along with them. That was a huge step to take. Cathy: Artists seem to be examining their position more and more in a global context. Rebecca Belmore represented Canada at the last Venice Biennale. You yourself recently did an artist-in-residency in Bellagio, Italy, in which you researched explorers and their purpose for coming, or attempting to come, to North America. What are your thoughts on this momentum? Colleen: There’s a sense of discovery. We never got to explore, so our age of exploration is just coming about. It took over five hundred years, but I’m now going back the other way, and discovering what the rest of the world is about.